Whether you’re trying to make the highest-level jewelry, or take advantage of the skill cape, crafting is near the top of the list of skills to max. Released in May of 2001, crafting follows a ‘choose your own adventure’ kind of method, where you could either achieve 99 extremely quick, for a hefty price tag, take it slower for a much lesser price, or even something in the middle. 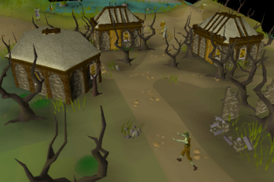 Get your crafting hat on as we go through the ways you can get to 99 crafting in Old School Runescape. 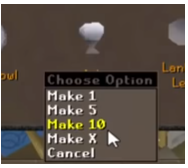 Before we get into specific levelling techniques for our OSRS Crafting Guide, we should mention some of our favorite quests that give a considerable amount of crafting experience, so you can zoom through those early levelling stages. Here’s a list of a few quests that give crafting experience. 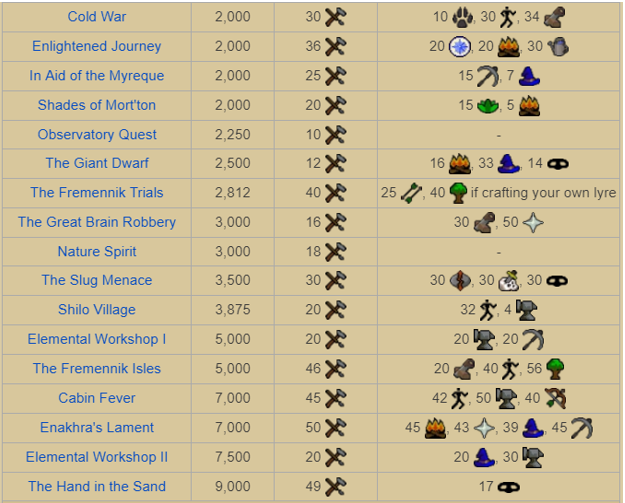 Note that the following quests are quests which we deem to be quite helpful for your whole Runescape journey. 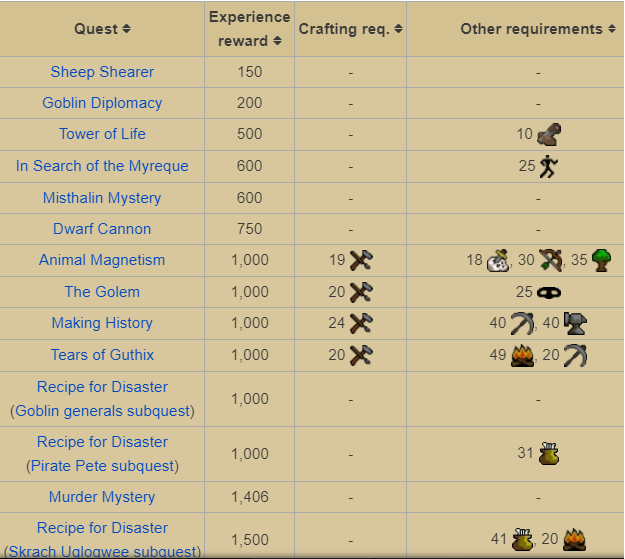 For a full list of quests that provide Crafting Experience, look below. Ask any Runescape ranged expert, a cannon is their best friend. To get a cannon, you’ll need to complete no other than the Dwarf Cannon quest itself. Doing so, you’ll even get some quick crafting experience along the way, that’ll surely boost you through some early levels! For this novice and short quest, you’ll need to head to Captain Lawgof, south of the Coal Trucks, northwest of the fishing guild, with a hammer. He’ll take you through the rest, it’s quite simple! There’re no crafting requirements, nor skill requirements for this quest. Free experience every day from a minigame – whose complaining? To reap these benefits, you’ll need to complete the Tears of Guthix quest. And even better, for your crafting journey, you’ll get 1000 experience along the way. For this intermediate and very short quest, you’ll need to go to Juna, who is deep inside the Lumbridge Swamp Caves, in the southside of the Lumbridge Swamp, with a lit sapphire lantern, a chisel, a tinderbox, a pickaxe and a rope. In addition, you’ll need 43 quest points, 49 firemaking, 20 crafting and 20 mining. When you’re on your ranged journey, your Ava’s device will be your best friend. It saves the majority of your ammunition, thus saving you tones of money (to put back into crafting supplies!). Doing this quest will also pocket you 1000 crafting experience! For this intermediate and medium quest, you’ll need to head to Ava in Draynor Manor, west of Lumbridge, with a mithril axe, 5 iron bars, ghostspeak amulet, 20 ecto-tokens, a hammer, a holy symbol, polished buttons and a hard leather. The quest requirements you need are The Restless Ghost, Ernest the Chicken and Priest in Peril. The skill requirements you need are 18 slayer, 19 crafting, 30 ranged, 35 woodcutting and if you’re an ironman - 31 prayer. A minigame which gives you combat, crafting, firemaking and prayer experience, all at once! 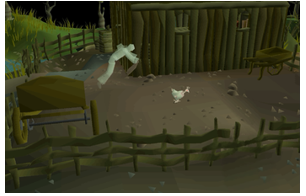 To unlock the Shade of Mort’ton minigame, you’ll need to complete the Shades of Mort’ton quest. 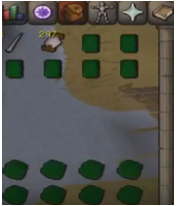 In the process, you’ll be getting 2000 crafting experience as well. For this intermediate and short quest, you’ll need to find the Diary of the Herbi Flax, resting on a shelf in a house on the southwest side of the village of Mort’ton. The quest requirement is Priest in Peril, and the skill requirements are 20 crafting, 15 herblore and 5 firemaking, as well as the combat stats to defeat 5 level 40 shades. 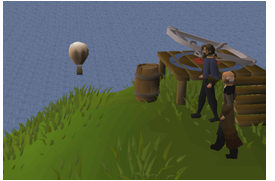 The Hot Air Balloon transport system is one of the handiest ways to get around Gielinor. To unlock it, you’ve got to complete the Enlightened Journey quest. Doing this quest, you’ll also get a quick 2000 crafting experience. For this intermediate and short quest, you’ll need to speak to Auguste, on the island of Entrana, with secateurs, a rake, a spade, 3 papyrus, a ball of wool, a sack of 10 potatoes, an unlit candle, yellow dye, red dye, 10 silk, a bowl, 8 empty sacks, 12 willow branches, a tinderbox and 10 normal logs. The skill requirements for this quest are 20 quest points, 20 firemaking, 30 farming and 36 crafting. The warrior, berserker, archer and farseer helmets are absolutely incredible for medium to high level combat, but they can’t be accessed by everyone. To unlock it, you’ll need to complete the Fremennik Trials quest. This quest will also provide you with 2812 crafting experience. For this intermediate and long quest, you’ll need to see Brundt the Chieftain, located in the longhall, in Rellekka, with 5252 coins, 1 beer, 1 raw shark, a tinderbox, and materials to craft a lyre (if you want to craft one). The skill requirements for this quest are the combat stats to defeat a level 69 NPC, as well as a relatively strong warrior, without weaponry. We all want to see what’s on the other side of the gate, and access Mort Myre. But to unlock that area, you’re going to have to do the Nature Spirit quest. And in the process, you’ll be getting a massive 3000 Crafting Experience! For this novice and medium quest, speak to Drezel, who is under the Paterdomus Temple near the River Salve, east of Varrock, with a silver sickle and a ghostspeak amulet, and equipment to kill three level 30 ghasts. There are no skill requirements for this quest, (so you can do it whenever you want! ), however there are some quest requirements, which aren’t too difficult. 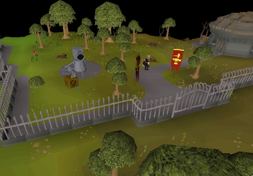 The quest requirements for this quest are Priest in Peril and the Restless Ghost, both relatively simple quests you would probably have got done in the early stages of your Runescape journey. Here we are, the first step in your crafting journey. Luckily, it’s quite a quick step, as you’ll be crafting leather gloves until level 7. To make leather gloves, you’ll need a piece of leather, as well as some thread, and a needle. Simply use your needle on your leather and select the glove icon. Sit back, as your character makes all your leather into gloves. Most preferably, you’d want to do this next to a bank, or a quick access point to a bunch of leather. Now, onto a free-to-play player’s dream – Gold Bracelets! In addition to zooming to level 20, you’ll be making some gold on the way. To make gold bracelets, you’ll need some gold bars (the equivalent to how many bracelets you would like to make), as well as a bracelet mould. 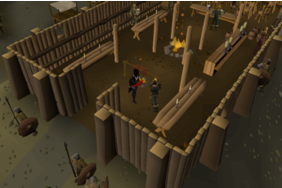 Head to any furnace (our personal favorites are Edgeville and Al Kharid, for their quick access to the bank) and use your gold bar on the furnace. 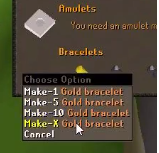 You’ll now be brought to an interface, and from here, it’s as easy as making all your gold bracelets. They take a while to make, so this goes for a fairly AFK low level method. Feel free to use this method for the next few levels after 20. We’re finally moving into the fast experience gains now. 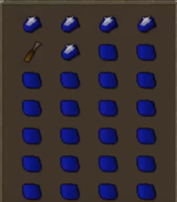 For the final method which incorporates all 3 of the following methods in this OSRS Crafting Guide, you’ll be cutting sapphires. Luckily, it’s a fairly simple method, and you’ll be zooming through these levels until 46 (or maybe even 63, but we’ll get to that later!) To cut sapphires, you’ll need a bunch of sapphires, as well as a chisel. Use your chisel on your sapphire, select ‘make all,’ and the game will do the rest! Bank your product, and repeat. Now that you’ve reached level 46, you’ve got three options on your hand. You can either speed through the rest of the skill, with the expensive and fast method, or take it slow, with the cheap and slow method. We’ve even included a Medium method, which incorporates aspects from both the cheap and expensive methods! Feel free to interchange between the two whenever you feel like it. 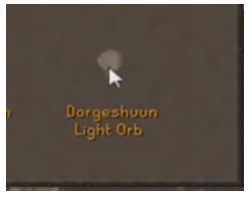 To kick off the cheap method for our OSRS Crafting Guide, you’ll be making unpowered orbs. To make these orbs, all you’ll need is a glassblowing pipe, as well as some molten glass. Preferably, you’ll want to stand next to a bank, for the most efficiency. The next step is just using your glassblowing pipe with the molten glass, going over to the ‘Orb’ section on the interface, and making all. After they’re all made, simply bank and repeat! You’re almost there! For the home stretch until 99 Crafting, you’ll be making light orbs. Luckily, we’ll be doing this close to the same way we did from levels 46 to 87. To make these light orbs, just like the unpowered orbs, we’ll need a glassblowing pipe, and a multitude of molten glass. We’ll be doing it the same way, using the glassblowing pipe on the molten glass. However, this time, instead of selecting unpowered orbs, (yes – you guessed it) we’ll be making ‘Dorgeshuun Light Orbs.’ The process is the same, wait, bank and repeat! Good luck getting to 99. 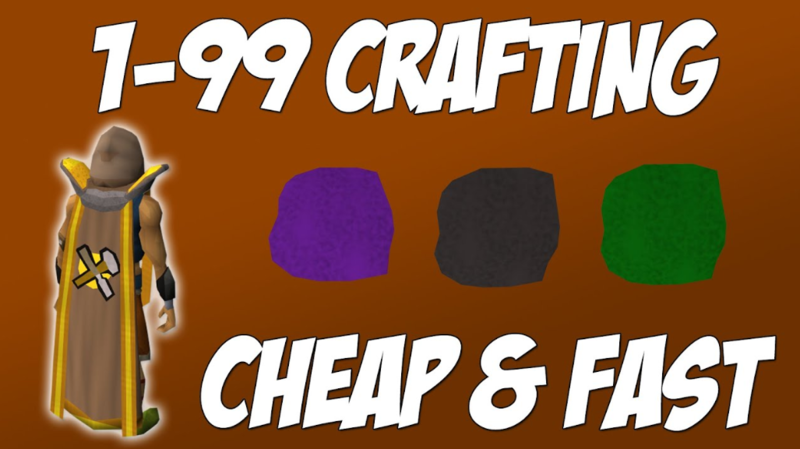 Scroll up to the first method in the ‘Cheap’ section of this guide, it’s the exact same! Exceptional experience, for a relatively low cost – what more could you ask for? For the grind until level 99, you’ll be crafting air battlestaves. For this method, you’ll need some battlestaves, and some air orbs (make sure you’ve got the same amount of each). 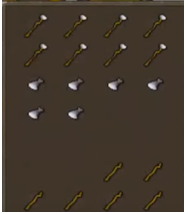 Now, standing next to a bank, withdraw 14 unnoted battlestaves, as well as 14 unnoted air orbs. And then, it’s just as simple as combining the two and watching the experience fly by! It’s the exact same as before! Scroll up if you want a reminder on cutting sapphires. Now, this is where the experience will come flying in! From level 63 to 71, you’ll be crafting green dragonhide bodies. For this quick and easy method, you’ll need a needle, some thread, and a bunch of green dragon leather (make sure it is leather, not hides!). From here, it’s as simple as using your needle on the green dragon leather and making all of green dragonhide bodies. At this stage, it’s just bank and repeat! Until level 84, we’ll still be crafting dragonhide bodies, except this time – we’re moving onto blue dragonhide bodies. However, the principle still remains – get a needle, some thread and this time, some blue dragon leather! 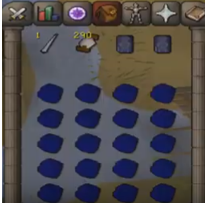 Like with the green dragonhide bodies, you’ll be using the needle on the blue dragon leather and making all blue dragonhide bodies. Sit back, and zoom through the levels, to prepare yourself for the final method! 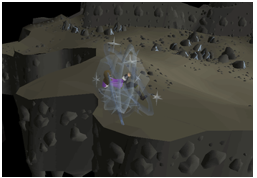 Here we are, the final method of our OSRS Crafting Guide – crafting black dragonhide bodies. Just like the previous two methods, we’ll be following the same principles to crafting success. For your final method for the crafting skill, you’ll need a needle, some thread and some black dragon leather. And yes, all you need to do is use the needle once again on the black dragon leather and make all of the black dragonhide bodies to wrap up the crafting skill! 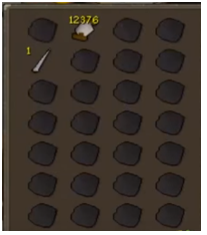 And there you have it, a 1-99 OSRS Crafting Guide. Have fun mastering the skill of Crafting, and getting that well deserved skill cape!